Sell individually or by the 24 pak! CAP CAPERS ARE THE BEST BASEBALL CAP DISPLAYS IN THE WORLD… its THAT SIMPLE! 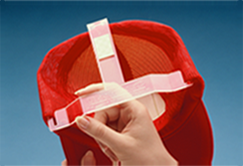 Cap Capers provide a way to display a baseball cap in a neat, organized way while keeping the cap properly shaped. Each Cap Capers baseball cap display holds one baseball cap individually and allows total versatility in display arrangements. 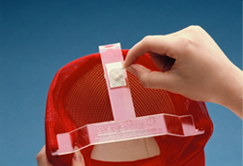 Cap Capers Baseball Cap Displays Are Easy To Use. The Best Wall Mounted Cap Rack! 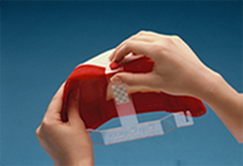 Manufactured in a flexible clear plastic for transparency against any color background, each Cap Capers cap rack has a slotted hole for a nail or screw. They also come supplied with a double-sided foam adhesive to permit mounting in a variety of places without the worry of nail holes. CAP CAPERS ARE THE #1 HAT RACK OF AVID BASEBALL CAP COLLECTORS AROUND THE WORLD! With Cap Capers, a collection of baseball caps can be displayed in a way to compliment any Showroom, Sports Bar, restaurant or gameroom. Cap Capers wall mounted baseball cap displays allow you to create an attractive baseball cap display for your retail store or exhibit boothe… which will lead to increased cap sales! CAP CAPERS – THE ‘GRAND SLAM’ of BASEBALL CAP DISPLAYS! They fit almost EVERY brand of Baseball Cap…. ! 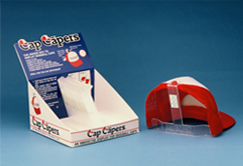 There are lots of Baseball Cap Racks, Baseball Cap Stands, Ball Cap Wall Mounted Displays…… but there is ONLY ONE CAP CAPERS!!! No matter what you call it – Hat Rack, Cap Rack, Wall Mounted Display, Baseball Cap Holder, Hat Holder, Cap Holder, Hat Display, Cap Display, Cap Caddy, Ball Cap Display, BallCap Buddy… CAP CAPERS are what you need. Minimum order is only one package of 6 Cap Capers. If you have any further questions concerning Cap Capers, feel free to contact us. We look forward to hearing from you! For Showrooms, Sports Bars, Restaurants & Gamerooms. THE #1 CHOICE of BASEBALL CAP COLLECTORS!